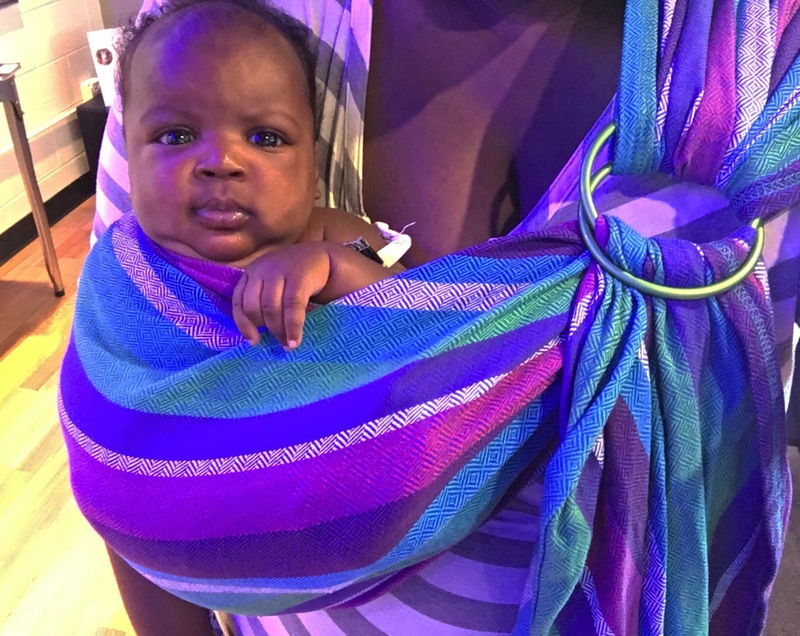 Sometimes this question will pop up: Ring sling or wrap? My answer to that question is BOTH. You can use two sling rings to turn your short wrap (size 2 or 3 for me…my base is an 8) to make a no-sew ring sling! 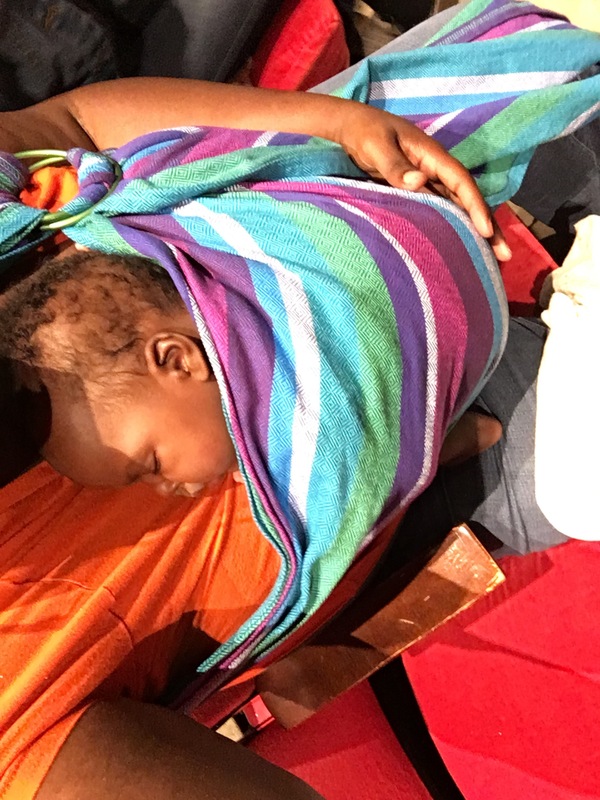 Long explanation not needed here–a no-sew ring sling is just a ring sling that isn’t sewn together. 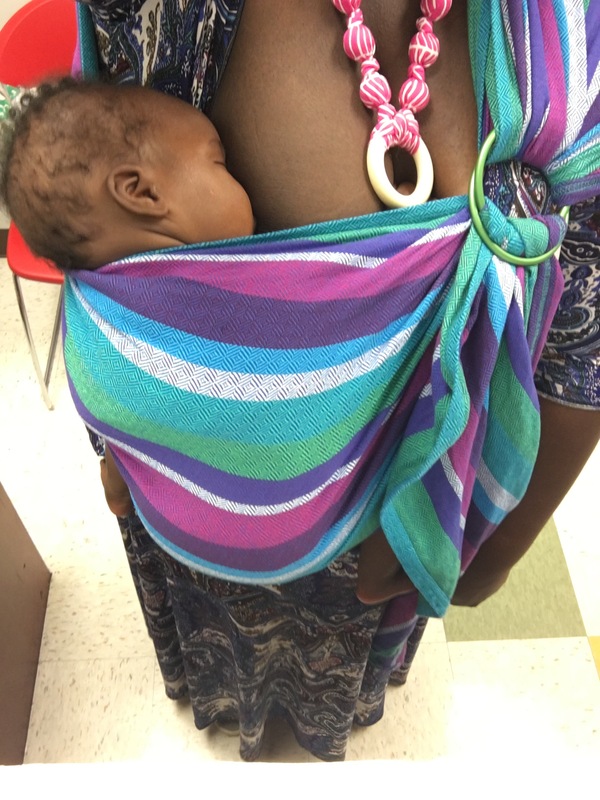 It is secured the same way that a regular ring sling is secured, with sling rings! 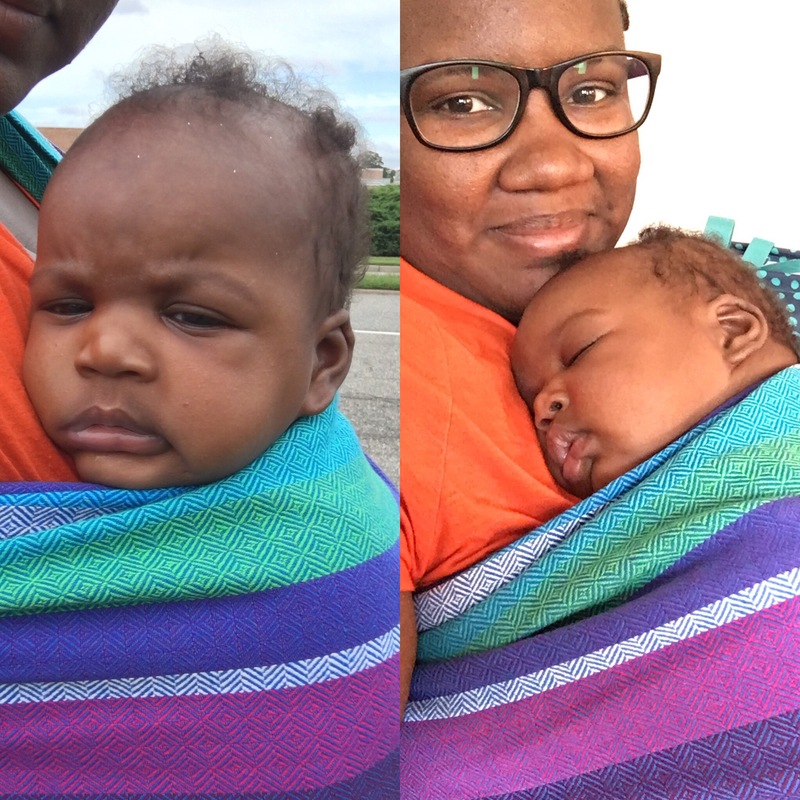 This photo tutorial is going to show how to make the no-sew, but not how to put the child in the sling. The video at the bottom will show how to put the baby in! The photo ring sling tutorial is right here-ring sling tutorial. First, get your two sling rings (I am using size large) and your wrap (I am using a size 3 Bijou Wear Blast Firecracker). Measure out how long you want your tail to be by wrapping the wrap around you with one side over your shoulder and the other across the front to meet the shoulder. Gather the fabric at your shoulder by your collarbone and that spot is where you want your rings to be. Pull the fabric through the rings. Hopefully that helped explain what I meant! Put the sling on your shoulder now with the short fabric tail under the long tail that you will be working with. Make sure that the top ring is further back than the bottom one. I’m pointing to it in that picture up there. Now to thread the sling just like you normally do a ring sling! Gather the fabric in front of you (I pleat it). Very pretty right? At this point I let it all hang down to make sure my fabric is not twisted. Thread the fabric through the bottom ring. Take your fingers through the threaded fabric to make sure that it is not twisted. It should make a cute looking puff of untwisted fabric. Pull the fabric back the same direction that it came from to get the sling all secured. Tuck the extra hanging fabric from the beginning of the no-sew part of the sling in the spread back pass and you are done! Now you are ready to put your baby in the sling! Maxine always loves going uppy front. Recently I got to try out two Kokoskaa KokoSplash water slings! The Classic and Deluxe are both mesh water slings. 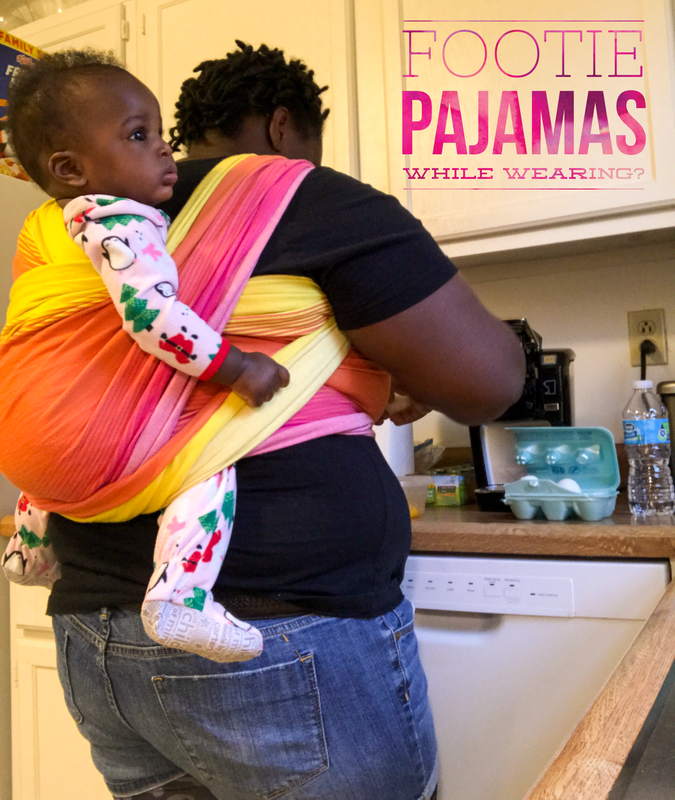 They can be used with babies from 8 pounds to 35 pounds and the Classic can be used up to 40 pounds! Brittany and Maxine are both looking past the camera in this picture. Maxine is in a blue and pink mesh water ring sling with pink metal rings. The KokoSplash Classic is a solid water sling that is great through toddlerhood. This sturdy mesh is perfect for wearing in and out of the water. It has plenty of texture and the rings do not budge once locked in place. My daughter is 30 pounds and she definitely did not feel that heavy while up in the sling. While in the water, the aluminum rings did not slip one bit. The mesh dries relatively quickly as well. Brittany and Maxine are taking a mirror selfie. 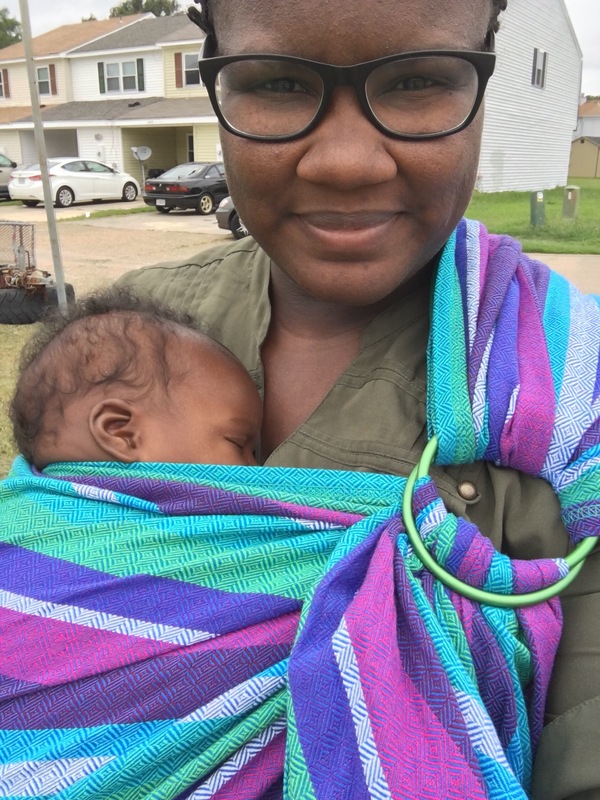 Brittany is wearing Max in a blue and white water ring sling. Maxine is looking into the mirror and Brittany is looking at the purple phone in her hand. The KokoSplash Deluxe is a softer, more luxurious mesh than the Classic. 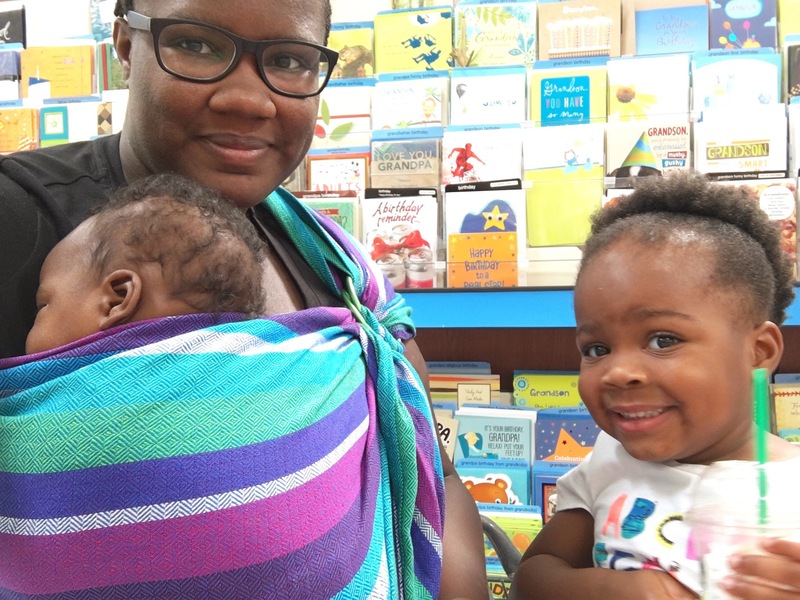 This sling is comfier on my shoulder than the Classic and is best for smaller kiddos. This mesh would be perfectly smooshy soft for a tiny baby! 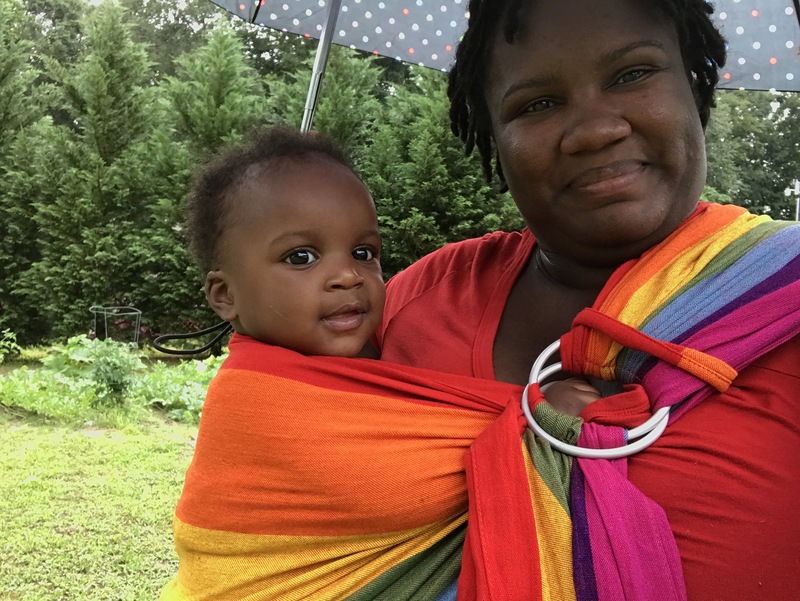 With a heavier kiddo, there was a tiny bit of slippage in the rings while trying to adjust the sling while dry, but as long as you are properly tightening, that should be no issue. The aluminum rings worked excellently while wet! The rings did not budge. This mesh dries relatively fast too. I would recommend these water slings to everyone! Especially if you enjoy the beach or pool. Showers are made super easy with these water slings too! Be sure to follow Kokoskaa on Facebook and Instagram!